These are recommended to fix cable conductors. These are used with 8 mm conductor or for supporting Air Terminals when used in conjuction with wall mounted Air Terminal base. Suitable for 4 way connection, straight, through or tee joints for Round Conductors. These are used for forming & bonding Tee joint for conductor. Above Bracket provides a 75 mm projection from the face of a wall. Manufactured either in Gunmetal or Brass. These are used for forming straight through joints. These are used for connecting Cable Conductors. Used for bonding to handrails, re-inforcing bars, pipes etc. Used for bonding circular conductors to metal surfaces. These can be fixed to the metal surface by using bolts & nuts or by welding onto the metal surface. Used for connecting to all types of metal structures upto 13mm thickness. Used for Bonding Copper & Aluminum Conductors to steel work. Used for mounting of air rods either horizontally or vertically..
Used for supporting taper pointed or blunt air rods with circular conductors on flat surface. Type AFL: Fixed conductor holder. Type AIL: Loose conductor holder. Fits all the sizes, universally adjustable wire attachment. For taking Lightning Conductors through roofs etc. Material - Bronze / Copper Alloy. Floor Ground Receptacle of Heavy Duty Construction. Receptacle furnished for all size Ground Rods, either plain or threaded. 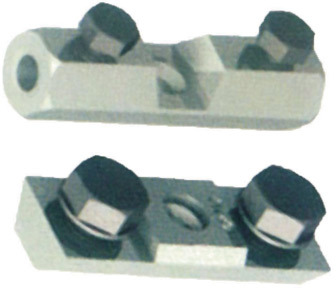 Equipotential Bonding Bar with Plastic & Base suitable for connecting. 1 Tape Terminal 30 x 5mm or Conductors 8 - 10mm2. 7 x one or multi - wired conductors to 6mm2 to 25mm2.